Home » What is Inbound Marketing and Why Should You Care? Even since the birth of modern commerce, marketing has all been about pushing messages to consumers. Whether it’s a radio ad, a print ad, or a billboard, conventional marketing focuses on interrupting a consumer’s experience with a marketing message. For obvious reasons, consumers don’t really like to have their TV, radio program or Sunday evening drive interrupted with advertisements. This is one of the reasons why traditional advertising is becoming losing its effectiveness, especially among millennials. This is where inbound marketing comes into the picture. Instead of pushing messages, inbound marketing aims to pull customers in by helping them. It’s a radical idea that is not only cheaper than traditional marketing, but also wildly effective. In this post, we’ll do a deep dive into inbound marketing. We’ll understand its origins, its impact, and more importantly, how it can transform your business. The idea behind inbound marketing isn’t exactly new; businesses have been distributing educational pamphlets, books, and guides with their products for years to attract and assist customers. However, before the advent of the internet marketing, it wasn’t really possible to reach scale with these tactics. At best, they remained a value-add for businesses – nice to have, but not necessary. The internet changed this dramatically. Suddenly, it was possible to cultivate an audience and reach them directly at scale via email, blog posts, and social media. Countless entrepreneurs built wildly successful businesses by simply helping customers find solutions to their problems (and pitching products along the way). The turning point in inbound marketing came when Brian Halligan, co-founder of HubSpot, defined and explained the principles and processes behind inbound marketing in 2005. A year later, Halligan and Dharmesh Shah founded HubSpot, which helped this marketing channel go mainstream. Today, HubSpot is a publicly traded company with a market cap exceeding $1.7B, and inbound marketing has become the go-to channel for small businesses. At its very heart, inbound marketing is all about helping people. Think about the last time you looked up a problem on Google. There’s a good chance you found a fantastic resource within the top 10 results that helped you solve the problem. There’s also a good chance you made a mental note of that site’s name. The next time you stumble upon a similar problem, it’s likely that you might go straight to this site, bypassing Google entirely. This is the essence of inbound marketing. When you help people solve their problems, understand issues, or offer expert advice, you develop goodwill among them. A customer is more likely to trust a brand that has helped it in the past than one which simply blasts an ad on TV everyday. If you do this frequently enough, prospective customers will even be happy to give you their emails/phone numbers. You can then take things a step further and start conversations with these prospects directly. Over time, these conversations can lead to sales and long-term relationships. Attract customers by solving their problems through high quality content (i.e. content marketing). Convert prospects into leads by capturing emails/contact details through CTAs, landing pages, etc. Close leads into sales by communicating with them via email/phone and helping them further solve their problems. This way, inbound marketing is much more intimate and customer friendly. It focuses on creating relationships rather than merely selling products. 61% of internet users research products online before buying. Inbound marketing generates 54% more leads than traditional paid marketing. Marketers rank inbound channels like email, SEO and content marketing ahead of PPC in terms of ROI. By 2020, there will be 1 billion smartphone users worldwide. Global internet population will hit 6 billion by 2020, i.e. nearly everyone will be online on some sort of device. There will be over 5 billion social media users by 2020. Both these stats and projections point to one thing: that internet usage is set to skyrocket in the next decade, and that more and more customers are going to rely on it to make purchase decisions. For a savvy business, doesn’t it make more sense to invest in the future of marketing, than to invest in dying marketing channels like TV or print? After all, as the great Wayne Gretzky once said, “Skate to where the puck is going to be, not where it has been”. 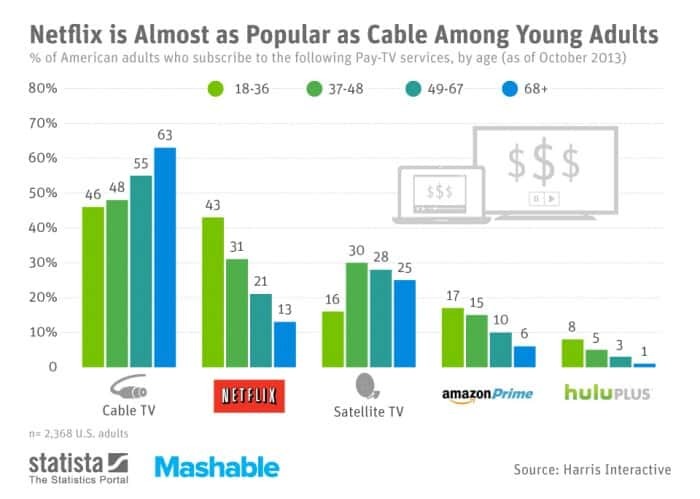 It shows that among young adults (18-36), Netflix is nearly as popular as cable TV. It shows that as popular as Netflix might be, it doesn’t even come close to 1/4th the popularity of YouTube. If you wanted to sell to millennials, wouldn’t it make more sense to create a cheap but fun video on YouTube than to spend hundreds of thousands of dollars on a cable TV ad? The latter is a dying medium among millennials, while the former keeps growing its audience. This is precisely the reason why inbound marketing is so important. It helps you reach an audience that doesn’t even show up on traditional marketing channels anymore. An average young consumer today is far more likely to get his news through Buzzfeed and her Facebook feed than a printed newspaper or even a news show. Which is to say, when you invest in inbound marketing, you invest in the future. For any forward-thinking business, this is vital for survival in a digital-first world. Inbound marketing is a radical idea. Instead of focusing on interrupting customer experiences through irrelevant and unwanted marketing messages, it helps businesses foster brand loyalty and authority by creating useful content and starting conversations. In a world where internet consumption is skyrocketing and traditional media is dying, it makes all the more sense to invest in an internet-first channel like inbound marketing.